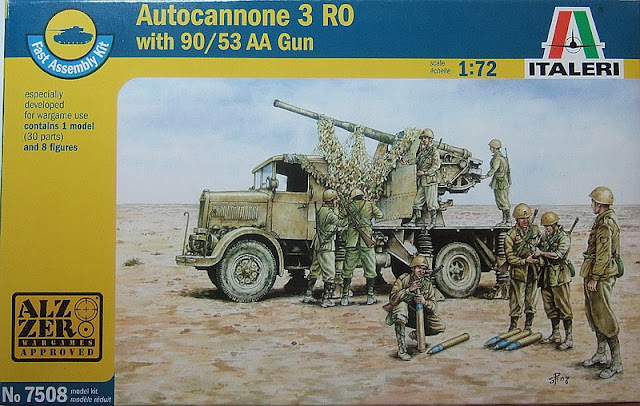 Today we make a very complete review, one that is a model kit and at the same time a set of soldiers, the Italeri Autocannone 3 RO. A quite impressive and big box, with the yellow round so you know it's not the typical Italeri kit. The artwork itself is a bit dull, and it almost shows the troops more than the vehicle itself. But the subject is too interesting to get distracted by the box. Being a fast assembly kit the score is a 7.5. I quite like fast assembly kits, as normally I don't see the reason to make a cab into 23 pieces when you can do it in one or two. Modellers that want further detail can add them buying a special resin set or improving with photoetched and plasticard. One of the curiosities of this set is that inside the box there are two sorts of plastic; hard plastic for the truck and semi-soft for the crew and the barrel of the cannon (presumably to avoid breakage). The kit itself is basic and of easy assembly, nearly not requiring any glue, but still with good detail. You really get a better result than with some old model kits still reissued today. One of the bad points is the lights, which should be round and are blended with mudfaces, and don't even detail with them, which sticks out quite a lot because the other things, even if made in few pieces, still have very nice detail. The other issue is the dimensions. It is made to fit nicely with the figures, but these are a very large Italeri type. The resulting kit is very sturdy and ideal for wargaming. With some improvements and dedication, can also become a first class model too. I would have liked, however, to be able to fold up the feet, to make the vehicle into a moving position. But I understand that would have required many extra pieces, so it will be left to the expert modeller with lots of free time, to cut, sand and create. 8 crew is a good extra really. Maybe some ammunition boxes or something like that would be welcome, but it is something you will have to provide looking in your box of spares. Nicely done, with a lot of detail and absolutely no flash. The projectiles are blended with the bodies, but it's not too important. These figures will not look too good along other 1/72 figures, like Caesar, and not very well either with Italeri's reissues of Esci sets. Completely perfect, everything is right. 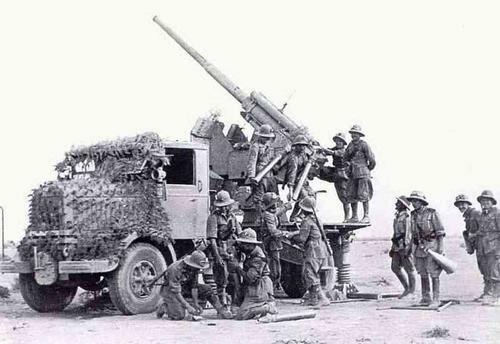 But I suppose it's not too important as Italeri does another artillery set where the crew are all wearing these helmets, the Italeri 149/40 artillery. Green or sandy, that's the question here. This vehicle was used until the 1970s, but it wouldn't have changed nearly anything. It is surprising that some Italeri models are nearly just not to be found on eBay. I found only one example, which at 12,00 € + 9 € shipping is very expensive in my opinion. In I bought it retail for 12 €, which is fair, considering is a big and bulky model of a lesser known vehicle with 8 crew.